My family enjoy carrot kheer immensely. It's not just tasty but also healthy. I borrowed this recipe from the 'Hare Krishnas' and made few changes while making it. 1. Peel and chop carrots finely. 2. Place carrots, almond and cashews in a pressure cooker and add 2 tbsp water. Cook to 1 whistle. Open the lid when pressure drops down naturally. 3. Churn the contents of pressure cooker in a blender to a paste. 4. Boil the milk. 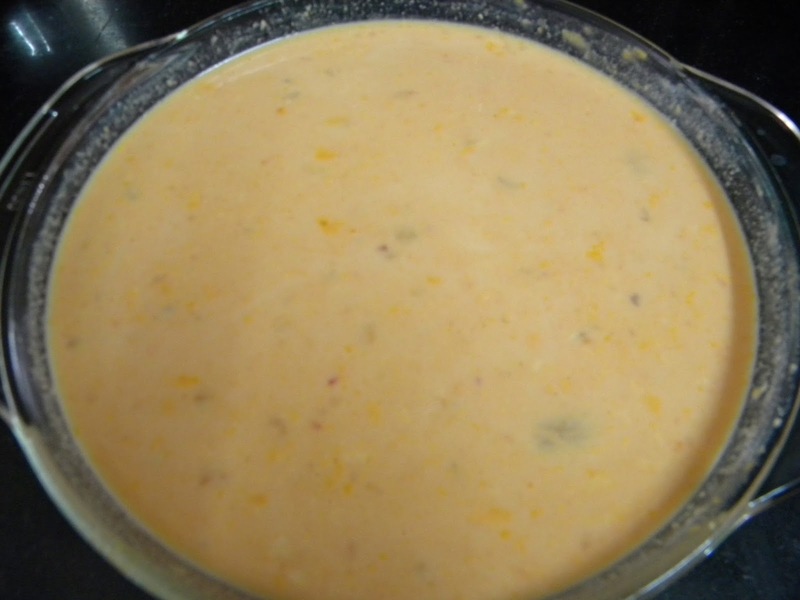 Add carrot paste to milk and cook on a medium-low heat for 10 minutes. 5. Add sugar and cook till sugar dissolves. Take out carrot kheer in a bowl and serve warm or chilled. Oats with milk or oats porridge is a quick to make, easy and healthy breakfast option. You can cook oats either in a pan or a microwave. I have shared the recipe for both. Having oats in the morning is a great way to start your day. 1. Take milk in a pan and add oats to it. If you are using sugar, add it. If using honey, add it after the porridge is ready. 2. Cook on a medium-low heat for about 5 minutes, stirring occasionally. Your oats are ready. 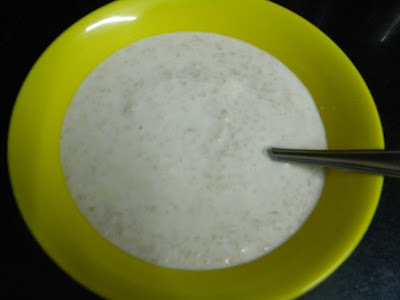 You can take milk in a microwave safe bowl and add oats and sugar to it. Cook on a micro high for 2 & 1/2 minutes. 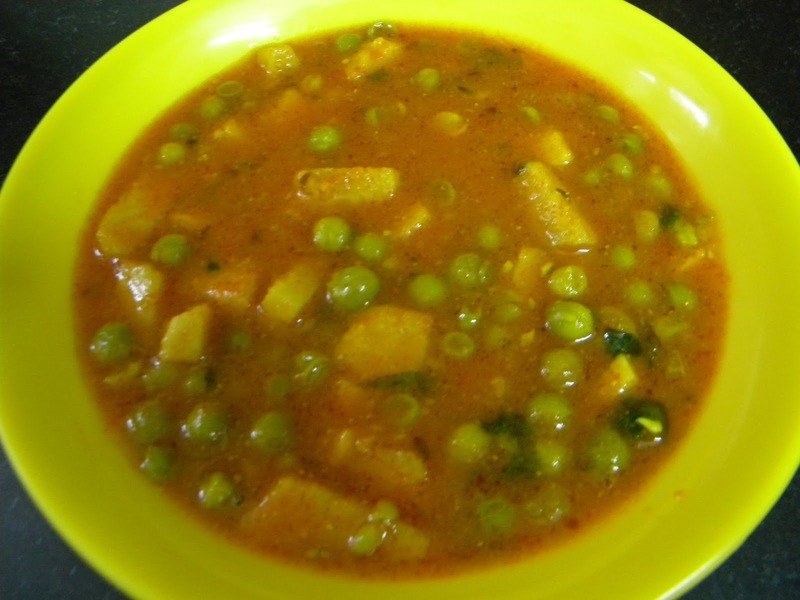 Jimikand matar ki sabzi is quite a tasty dish and very easy to make. 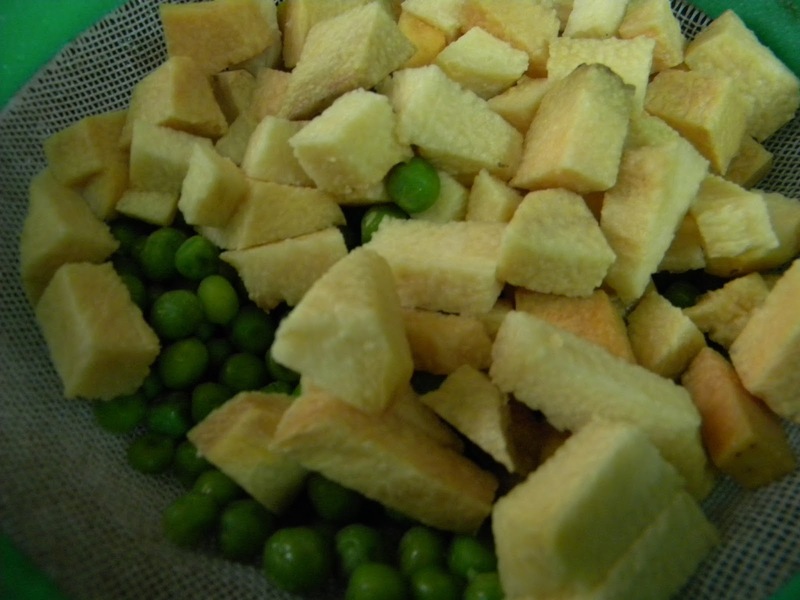 In the recipe given below, I haven't deep fried jimikand like many people do because there is no need. Jimikand is also known as suran or yam. 1. Peel and wash jimikand. Chop it into medium size pieces. 2. Heat oil in a pressure cooker and add cumin seeds. When they turn darker, add hing. 3. Add pureed tomato and all the spices except garam masala. Saute till oil begins to separate from the masala. 4. Add jimikand, matar, water and salt. Pressure cook for 5 minutes on high heat. Turn off the heat and open the lid of the cooker when pressure drops down naturally. 5. Add garam masala and cook for 1 more minute. Take out in a serving bowl and garnish with chopped coriander leaves. 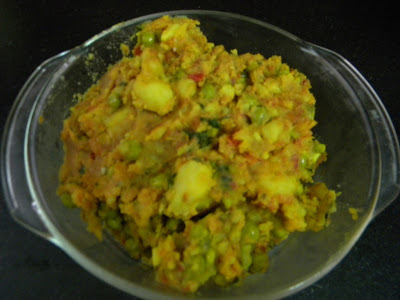 Serve hot jimikand matar ki sabzi with roti or paratha. 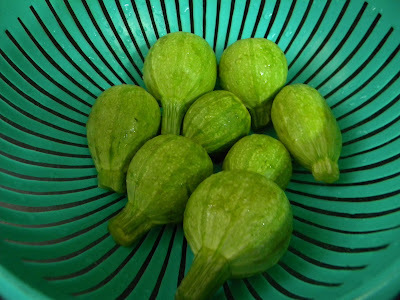 Tinda is a summer vegetable and tinda shown in the picture comes for a short period of time. 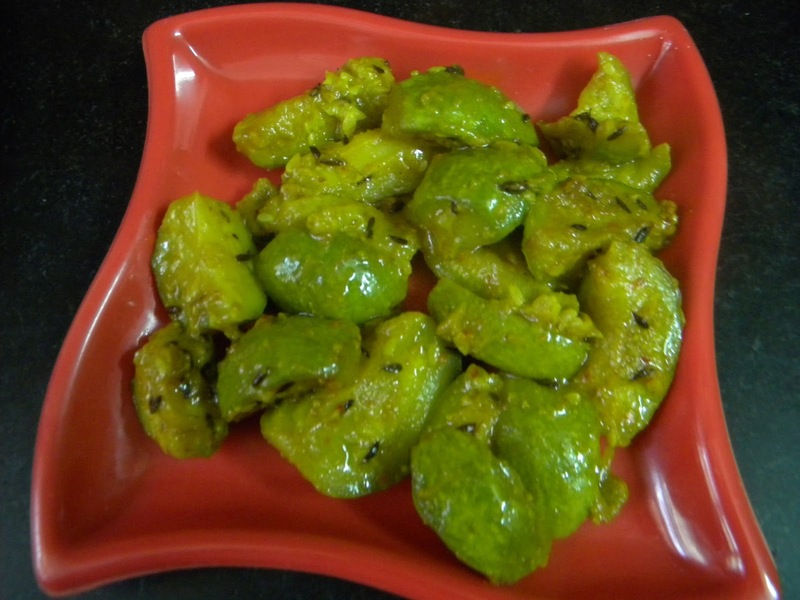 This tinda ki sabzi has a unique taste and worth trying. 1. Tinda shown in the pic need not be peeled. So, remove upper and lower portion of tinda, wash and chop them into 4 quarters lengthwise. 2. Heat oil in a kadhai or a pan and add cumin seeds. When they change color, add hing. 3. Add tinda, salt and all the spice powders except amchoor. Mix them. Cook on a low heat ,covered. Stir occasionally. 4. This tinda need not be cooked too much so when tinda is tender, add amchoor, cook for 1 more minute and turn off the heat. 5. Seve hot tinda ki sabzi with roti or paratha. 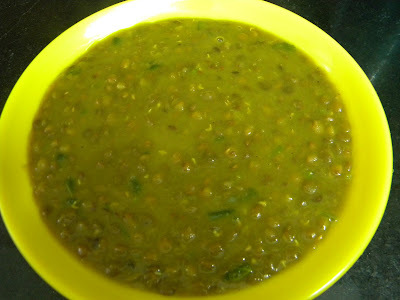 Sabut masoor ki dal tastes good with simple tempering of hing, jeera (cumin seeds). We enjoy this dal with both rice and roti. This dal is very protein rich and tasty. 2. 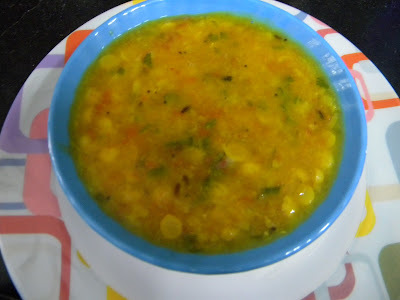 Place masoor ki dal in a pressure cooker along with 4 cups water, salt, turmeric and red chilli powders. Pressure cook to about 15 minutes on a high heat. 3. Open the lid of the cooker when pressure drops down naturally. Add amchoor and garam masala and cook for 1 minute. 4. Heat ghee in a small tadka pan and add cumin seeds. When they turn darker, add hing. Add this tadka or tempering to the boiled dal. 5. Garnish sabut masoor ki dal with chopped coriander leaves (cilantro) and serve hot with roti or rice. This recipe of dry aloo matar is a very easy one and with commonly available ingredients. This sukhi sabzi tastes really good with roti or paratha and is liked by most people. 1. Heat oil in a kadhai or a pan and add cumin seeds. When they turn darker, add hing. 2. Add ginger and saute till light brown. 3. Add chopped tomatoes and all the spices except garam masala. Cook on a medium heat till oil begins to separate from the masala. 4. Add aloo, matar, salt and mix well. Turn the heat to low and cook covered till matar turns tender, stirring occasionally. Add garam masala and cook for 2 more minutes. 5. Garnish dry aloo matar sabzi with chopped coriander leaves and serve hot. Chana toor dal makes for a good combination. They taste great together and also make a protein rich dal. Ever since I tried it, it has become a regular in my home. 1. Wash the dals thoroughly with several changes of water. Soak them for about 20 minutes. Drain. 2. Add dals, water, tomatoes, salt, red chilli and turmeric powders to pressure cooker. Cook for about 10 minutes on high heat. Open the lid of the cooker when pressure drops down naturally. 3. Heat ghee in a small tadka pan and add cumin seeds and rai. When they pop and crackle, add hing. Add this tadka (tempering) to the cooked dal. 4. Garnish chana toor dal with chopped coriander leaves (cilantro) and serve hot with roti or rice.